How is it possible for creative placemaking projects to be more inclusive? What would that look, sound, and be like? For the most part, these projects occur in either underserved communities or they try to bridge the gap between unevenly developed communities and sectors; uneven, that is, from the standpoint of the more financially prosperous partner involved. Because these projects seem to naturally rely on long-established cultural channels, they tend to reflect the interests of individuals and entities already supportive of the existing social framework. This means that, if left unchecked or incurious, they can exacerbate existing structural inequalities--be they racial, ethnic, financial, environmental, or gendered. Read more and join the conversation. NALAC Regional Arts Training Workshops are convened throughout the nation to provide comprehensive professional development, training and a space for community dialogue among the Latino arts field and other diverse arts sectors. Have a job, call for entries or training that you'd like others to know about? Post it on our Opportunities section of the NALAC website. It's free! We are beyond excited to announce that award-winning performance poet, playwright and performer Magdalena Gomez (pictured above) will be our featured keynote for the Detroit Regional Arts Training Workshop. 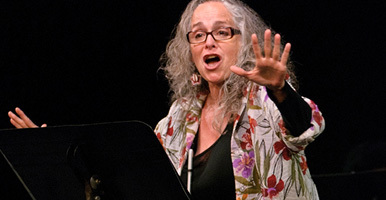 Dancing in My Cockroach Killers, a dramatization of her poems and monologues, was performed in 2013 to the critical acclaim of Off-Broadway audiences in New York City. She is also founder of the Ferocious Women's Group bringing to public view voices of women and girls through writing and performance. Meet us in Detroit for our summer Regional Arts Training Workshop June 5-6. Our regional trainings offer professional development, training and a space for community dialogue among the Latino arts field and other diverse arts sectors. But that's not all: By attending, you gain a national network that is essential to your personal advancement, and to the growth of the Latino arts community. Registration is just $20 for members and $40 for future members, and can be made online right now. Our three-day intensive, hands-on training that builds advocacy skills and knowledge about the role of government and public institutions in the arts field is April 28-30 in Washington, DC. Applications to the ALI are accepted from all alumni of the NALAC Leadership Institute. Congressional Staff and experienced arts advocates will impart skills to enhance efforts on behalf of Latino arts and culture. Learn more and apply online now. You asked for an extended deadline... and we're giving it to you! The NALAC Leadership Institute (NLI) is a week-long rigorous program in arts management and leadership development that delivers innovative and practical strategies that lead to successful business practices in the arts. Apply now--the deadline has been extended through March 6 only! Last July, Casandra Hernandez participated in what she calls "one of the most powerful and invigorating professional development experiences of my career"-the NALAC Leadership Institute. Read her reflection on the Arizona Commission for the Arts blog here. Artists, collectives and community-based organization in the United States, Mexico and Central America engaged in a continuous and ongoing artistic exchange that supports, preserves and extends the cultural practices between communities in two or more countries can apply for a Transnational Cultural Remittance Grant. Learn more and apply today. We were saddened to hear of the passing of Latino artists and scholars who paved the way for new artists today. We honor the below, and remember all those who have died at the hands of injustice. The National Association of Latino Arts and Cultures (NALAC) is a legacy organization investing in the Latino heritage of this nation. For over 25 years, NALAC has built a strong foundation for the promotion of Latino arts and culture and its advocacy efforts have advanced issues of cultural equity and raised the visibility and understanding of Latino artistic and cultural expression. The National Association of Latino Arts and Cultures (NALAC) is the nation's leading nonprofit organization exclusively dedicated to the promotion, advancement, development, and cultivation of the Latino arts field. In this capacity, NALAC stimulates and facilitates intergenerational dialogues among disciplines, languages, and traditional and contemporary expressions. NALAC serves thousands of Latino artists and hundreds of organizations representing a national and international community of multiple Latinidades; a network that crosses many cultures across the Latino Diaspora. For more information visit our website at www.nalac.org or like us on Facebook at www.facebook.com/Nalac.arts1. Main photo: The Buena Vista Gardens Building Mural by Lead Artist Valeria Aranda in collaboration with the San Anto Cultural Arts Mural Program, 2006. This mural was painted by San Anto Cultural Arts. Top things to know photo: Magdalena Gomez from TRGGR Radio.